Last weekend, Mr. True2Scale and I attended our first N.A.M.E. National Convention in Cleveland, Ohio. We had a fun time getting to know fellow miniaturists, eating great food, and shopping for items for my soon-to-arrive Tuscan house. And...a visit to Cleveland isn't complete without touring the Rock and Roll Hall of Fame. After all, I couldn't pass up the opportunity to see the meat dress! This year's convention theme was With a Song in My Heart. The souvenirs given to the attendees reflect the musical theme. 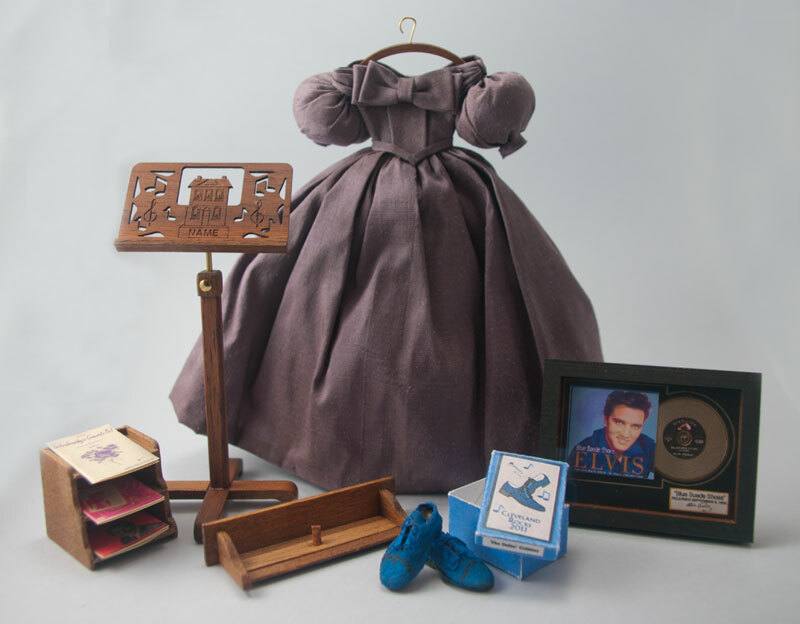 The 1:12 scale souvenirs were a dress worn by Deborah Kerr in The King and I, made by JoAnn Roberts; an adjustable music stand by Tom Walden; and blue suede shoes by Sylvia Rountree. The steering committee made a gift to complement each souvenir, including a wooden wall hook for the dress; sheet music and a storage box; and a framed, gold record of Blue Suede Shoes. A portion of my table at Mini Mart. 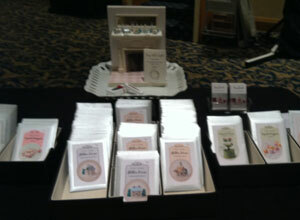 The convention provided me with my first opportunity to sell my mini kits at a show. I sold as part of the Mini Mart, a 2-hour Thursday night frenzy that left Husband and me breathless and exhausted! Thank goodness for the help of a kind friend who assisted with writing receipts. On Friday, I took a class from Shannon Moore and learned to make a corner chair. It's a beautiful piece that I some day hope to finish and post a picture. I REALLY do want to finish that chair! 1:12 scale greenhouse and florist shop. Working fountain surrounded by shops. Oh I do love the dress made by JoAnn Roberts. It’s absolutely cute! !